The fast RIB boat gets you to the coral reef in about 25 minutes. Two snorkeling locations are covered in about two hours. It begins with a short island/beach snorkel then zooms offshore to either Eastern Blue cut or Western Blue cut or Chub head breakers. The choice of places largely depends on the weather conditions on the day. While you will certainly pass by some lovely coastline on the way, this tour is really meant for sheer snorkeling enjoyment. This snorkeling boat tour was earlier run by Jimmy O’Connor for many years. After he retired, Chloe Mckey took it over in 2010. Earlier, they offered three offshore snorkel locations in about three hours. Since 2013, they take you to two locations in about two hours. Update June 2016: Now Jesse James snorkel tour is operated by Captain Kirk. The boat PISCES is a 31 feet fiberglass boat with glass bottom. It has a capacity of 16 persons. This used to be a U.S coast guard boat. 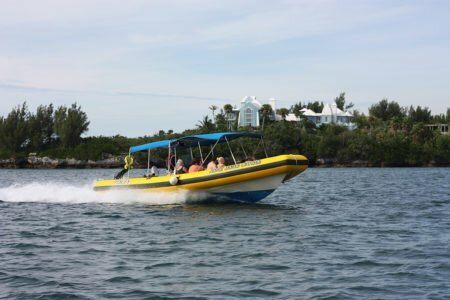 This boat is relatively small and fast, and gets you to two snorkeling points one after the other quite quickly. You are able to snorkel in two different locations in a single cruise. You will spend 40-50 minutes in each location. Depending on the weather on the day, two of the following three sites would be chosen by the captain. This is at King's Point, located at the western end of the island, close to Cambridge Beaches resort. Even though this is only a beginner's swim at shallow water, you can still see a lot of corals, brain corals, fans, etc and colorful fish like parrot fish, bream, groupers and maybe even a barracuda. The experienced snorkelers can snorkel around the island. Two famous shipwrecks are covered - The Constellation sunk in 1943, and The Montana wreck, sunk in 1863 sit in 15 to 18 feet of water at Western Blue Cut. This is at the north-western side of the island. These are great snorkeling areas. Sometimes the captain may decide to cover an alternate wreck - the Darlington that was sunk in 1886. This is an underwater area located close to Western Blue Cut and is in about 8 feet of water. The different kinds of colorful corals, fish and other marine creatures like sea fans, rods etc would be almost within arms reach of the surface. The entire underwater area is so beautiful that you will feel like you are in a tropical garden paradise under the water. During the high season (June to September) they offer two trips, one in the morning hours and the other in the afternoon. However on Sundays there is only one afternoon trip. During April, May, October they operate only afternoon trips (they can accommodate morning trips on special requests). In the other months Jessie James usually does not operate. On request they offer courtesy pickup and drop from/to the Kings Wharf (Dockyard) for the cruise ship passengers. Snorkel Cruise: $65 per person (children $45, age 8-10). As part of the tour cost, snorkeling gear is provided by Jessie James. They also have life jackets for non-swimmers. On-board complimentary drinking water is provided. You will need to wear bathing suits and bring your towels. Update June 2016: The Jessie James snorkel 2-Stop Tour has changed ownership to Captain Kirks Coral Reef Adventures. The amount is $70 for adults (over 12yrs) and $50 (under 12yrs) children under 5 are free! The boat PISCES departs from Royal Naval Dockyard (Sandys) near the Watersports Center. If your cruise ship is docked at Kings/Heritage Wharf, you can easily walk down to the boat. We took the Bermuda Sightseeing and Snorkel Tour with Captain Kirk in June. Zoe was our main tour guide and she did a great job narrating as we pulled out of the dockyard. The America's Cup was finishing up, and we sailed by the USA and New Zealand boats, and she explained the races to us. We went by an area with lots of sea turtles, and everyone on board got to see them. We then went to the lower deck of the boat to look through the glass at the shipwreck of the Vixen. Then we docked at our snorkel site. This turned out to be the most disappointing part of the tour. The water was choppy and hard to swim around in. They do give everyone a noodle. There weren't that many fish. We did a lot of off shore snorkeling the day before and saw much better fish & coral. There was a very shallow area nearby, and most people from the tour gave up on snorkeling and just played in the water. Overall, the tour itself was worth it, but not if your main objective is snorkeling. We were there on a cruise ship in June, and our family group took Captain Kirks Coral Reef Adventures shipwreck snorkeling tour, but it was very disappointing. We had to change boats before we got out of the harbor (the first one was having engine problems), so we were crowded into a smaller boat. The weather wasn't good; they should have cancelled the trip. The waves were choppy, so I had to stay in the water the entire time (to avoid getting seasick after we arrived at the snorkel stop) and the water was cold; all of our masks fogged up so bad that none of us could see anything (it was new equipment and they hadn't sufficiently "cleaned" the film off the masks), and even if we could see clearly, it wasn't very good snorkeling. Maybe we just had a bad day, but I most certainly wouldn't recommend that snorkel trip! I was a bit disappointed in this cruise. Part of the draw for me was the Hamilton pick up/drop off as I was staying near town but when the tour was nearly over I was asked to disembark at Dockyard as I was the only passenger going back to town and it was inconvenient to take me back in Hamilton... (I was given a ferry token for my trouble.) The ferry was just leaving as we pulled in and as I had to wait another hour for the next one I missed my lunch plans with my friend. My other complaint is that if you're going to insist on cash only you should ensure you have change as not everyone has exactly $65. I ended up giving the tip before the tour even started as getting change for my $80 was an issue - I had planned to give a tip at the end of the tour but would have liked for it to have been my choice. On the plus side the boat was fast and the early morning timing meant that we beat the bigger tour boats to the snorkel sites. Chloe is very knowledgeable about Bermuda and the snorkel sites were beautiful, I could have spent all day out there. I'm sad that the 3rd stop is no longer an option as it was under previous ownership - it would have been great to see yet another part of the lovely island of Bermuda! My family just experienced the Jessie James Snorkeling trip July 6th. We got our money's worth of snorkeling - shipwrecks, fish and sea gardens. Loved the small boat and small number of people on board as compared to the larger boat tours. It was nice to learn about local facts from Jessie and Dominic. For the not too strong swimmers, noodles were given out to float with. Boat ride was fun. The boat even has a small bathroom on board if necessary. It has been almost a year ago that we took our first tour with Jesse James and wrote a review. I'm happy to report that the trip on June 3rd had none of the weather issues compared to the first trip. The tour is wonderful! Jimmy is a great host and each time we find out some more about him and the beautiful islands of Bermuda. We now know, by direct comparison, that his tour is the BEST. You get to dive at 3 separate areas and each with their own uniqueness. That is compared to another operator that only took us to one snorkel location. The wreck dives were very interesting and we saw lots of fish. Jessie James may not have free Rum swizzles for the way back, but he more than makes up for that with giving you actual time diving/snorkeling, which is what you really pay for. His boat is fast and that, too, grants more in the water time to explore the sights and locales. We still recommend that to keep anything that you need to take with you dry, invest in a low-cost, easily packable “dry bag”. My wife says we shall only go with Jessie James Tours in our future. Last July, my wife and I scheduled a snorkeling trip with Jessie James cruises. Unfortunately the weather had been windy and unsafe for sites on the outer reefs. However, Capt. Jimmy knew of some in-shore areas that were loaded with fish and made the trip enjoyable. A rainstorm quickly appeared and cut short our final dive, but we still had fun. We got soaked from the rain on the way back to the dock and the only negative we had was our extra clothing got soaked, too. I would suggest to anyone to put things in a "dry" bag if you wish to take any towels or extra clothing. The fact that the boat is smaller than some made the trip more enjoyable as you get to know the other folks more that way. We will seek out Jessie James tours again.